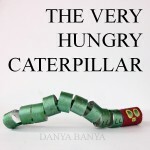 Remember the Very Hungry Caterpillar toy that I made out of toilet paper rolls the other day that JJ didn’t want to make? 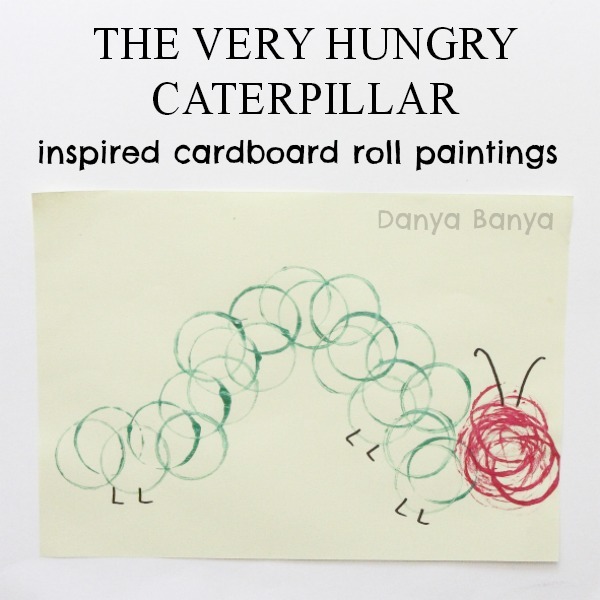 Well, I thought I would try a different tack – so I suggested we paint a Very Hungry Caterpillar using the cardboard rolls instead of a paintbrush. 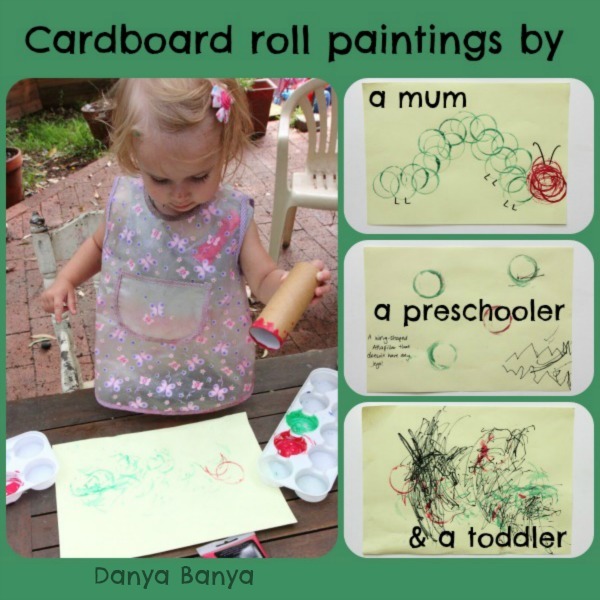 JJ (3 years and 9 months) loves to paint, especially if it involves painting with some kind of twist, so she was jumped at the painting with toilet paper rolls idea. I like to paint alongside the kids. 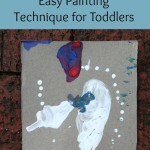 It allows me to show them new techniques, without overly directing or correcting their own creative process. 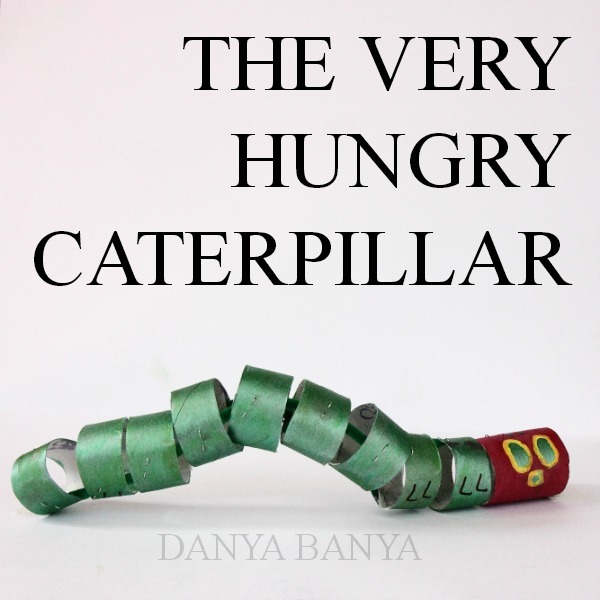 On this occasion I painted what I reckon (IMHO) is a reasonably respectable interpretation of The Very Hungry Caterpillar. It ended up looking like this. Bee went for a more abstract creation. She had an absolute blast, first with the painting, and then drawing with the markers. For 18 months, she is such a creative soul! Whilst I don’t think Bee was intentionally painting and drawing anything in particular, she was certainly copying technique. 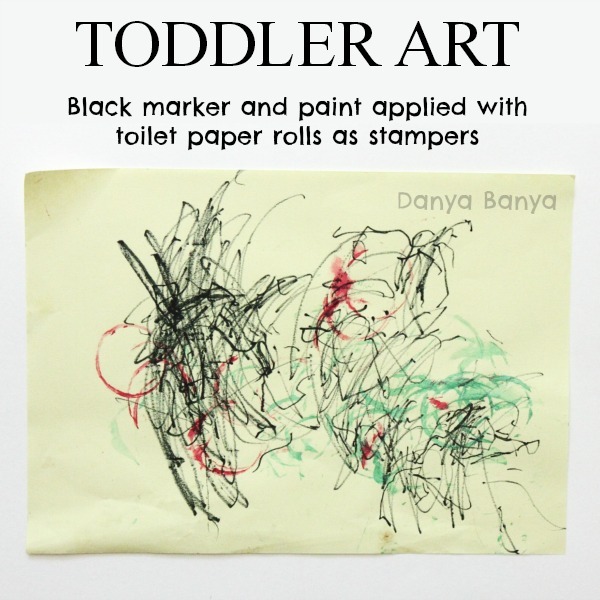 Art is such an awesome activity for toddlers. There is immediate cause and effect. 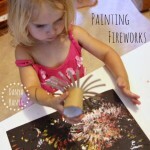 Learning to hold a cardboard tube or marker is all great fine motor skills practice for this age group. JJ declared that she wasn’t painting a Very Hungry Caterpillar after all. She was painting a Wing-Shaped Attapillar. She spent a lot more time imagining the characteristics of her Wing-Shaped Attapillar than she did actually painting. She decided it didn’t need feet drawn on, as it would slide along the ground instead. 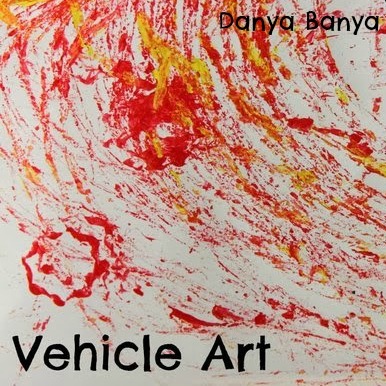 In case you missed it, you might also want to check out my The Very Hungry Caterpillar craft, or if you like painting without brushes, here’s a painting we made using vehicles instead. Previous: Two ingredient bread dough – that kids can make, play with, and eat! My recent post Turtle – Just Playing? “Writing a story using a combination of drawing, dictation, and writing” is a kinder skill in our area. Sounds like she is mostly there! Even though I teach Grade 4 this would still be a great idea for art because I'm always looking for alternatives to paintbrushes (which are hard to wash). 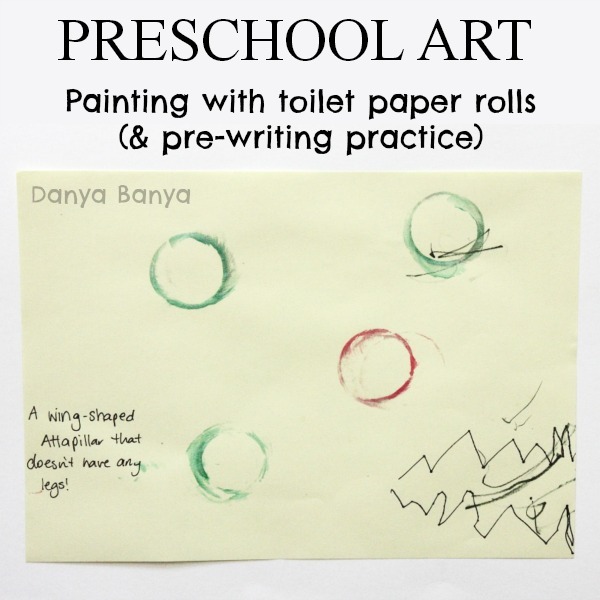 We have to microwave to toilet rolls to kill any germs of course 🙂 This is a lovely blog Danya! Thank you Michelle! Microwaving is a great way to kill germs – or you could use paper towel tolls, the cardboard rolls on the inside of gift wrap etc, and just cut them down to size too. 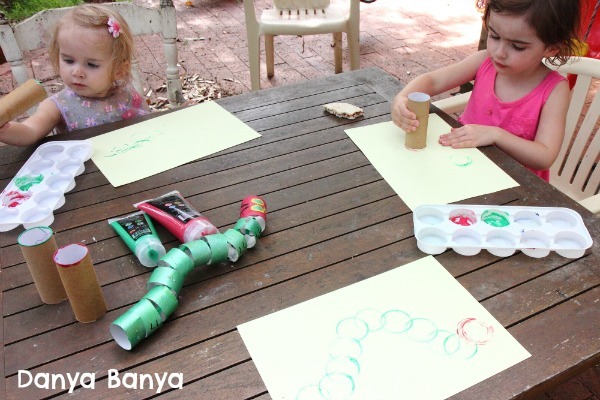 Afterwards, we let the paint on the ends of the cardboard rolls dry, and then used those rolls again for other crafts, so you can reuse your upcycles :). Yay! 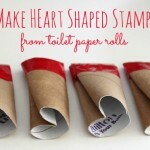 Another great idea for toilet rolls! Love it! 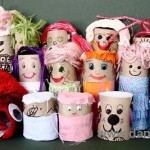 Always love new cardboard tube crafts, and the creativity of kids when they go on to do it their way!